"Why are we trying to kill all the broken people? "—Brian Stevenson, Just Mercy (2014). 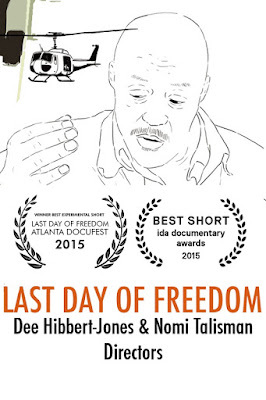 Dee Hibbert-Jones and Nomi Talisman's Oscar®-nominated documentary short Last Day of Freedom (2015) is, in essence, the little film that could. Framed within a heartfelt testimonial that lasts only 32 minutes, Last Day of Freedom concisely relays a painfully personal story that at the same time addresses a cluster of contemporary social concerns—the failure of our country to honor and help veterans suffering from PTSD who are incapable of returning to civilian life; the criminalization of the mentally ill and the homeless; a prisons-for-profit system that benefits from the death industry of capital punishment; and the secondary trauma experienced by marginalized communities and innocent families with relatives on death row—huge dimensions for such a small film! Few films, let alone an animated documentary short, have emotionally devastated me as powerfully, in precise sharp strokes, as Last Day of Freedom. There are a lot of reasons not to be interested in this year's Academy Awards® broadcast, already hobbled by controversy over its institutionalized racism, but Last Day of Freedom is not one of them. I have my fingers crossed that something as important and accomplished as this film will rise above Hollywood's pageantry of mediocrity to secure the honor it deserves. In a hellish "third tour of duty" within his own mind, Manny Babbitt suffers a dissociative break and kills an innocent woman. Hoping to do the right thing, his brother Bill turns him in to the police, but is failed by the criminal justice system. Instead of his brother receiving the mental care he requires, he is expeditiously sentenced to death. In 32 breath-halting minutes, Last Day of Freedom searingly indicts institutional and infrastructural failures that capsize on each other like cascading dominoes. No help. No justice. No mercy. No closure. When they first started working on the film, Hibbert-Jones and Talisman couldn't secure major funding because no one wanted to put money into a film about the death penalty, considered too controversial an issue. They struggled for meager support. Yet, since first starting production, these issues have become increasingly prominent in the cultural zeitgeist, which they now believe might help to propel the film forward. We met for coffee to discuss the film no less than a few days after the tragic execution of Mario Woods at the hands of the San Francisco Police Department, which has inspired a groundswell of protest in the Bay Area, joining a nationwide uproar decrying police misconduct against the mentally ill, the homeless, and communities of color. Why, indeed, is there so much concerted effort to kill all the broken people? Last Day of Freedom has been winning several awards on its festival run, most recently the Best Short Film at the International Documentary Association, which secured the film's nomination for the 88th Academy Awards®. It's an absolutely remarkable and assured effort from Mission residents and first-time filmmakers Dee Hibbert-Jones and Nomi Talisman. It is the first in an intended series of films for a proposed multi-platform project exploring secondary trauma by way of testimonials of family members who have relatives on death row. As part of her job with a non-profit offering media services to these families, Nomi Talisman and her partner Dee Hibbert-Jones—with whom she's been collaborating since 2004, exploring stories about "little people hurt by big systems"—recognized early on the potential of telling these stories to a general public. After securing permission from Nomi's employer, the two began interviewing several family members from three different families with relatives on death row. "These people were amazing storytellers," Hibbert-Jones emphasized, "and their stories were so egregious." The challenge was to craft a linear narrative. Their research had given them a series of stories but Bill's story stood out in the unique way it was being told, and became the lead story by which they could address ideological issues of infrastructural and institutional failures for communities deemed disposable, and specifically the secondary PTSD trauma associated with the death penalty impacted on innocent family members. As an experimental short-form documentary Last Day of Freedom achieves its linearity through a gradually-constructed process of unfolding information rendered through rotoscoped animation. The animation intrigues in how it simulates film, even metatextually incorporating leaders as chapter headings. The force of Bill's narration was so strong, textured and detailed that they knew they didn't need to literally illustrate it. Instead, the animation serves to visually enhance the emotional resonance of Bill's narration and his incremental style of revealing his story; a style that bears an authentic masculine reserve that resists being overcome with emotion. As an animation choice, rotoscoping—though, at this juncture, no longer particularly radical or cutting edge—was important in relation to the content and allowed a fluid transparency between the visuals and the narrative. More plastic animation techniques would have caused a disassociation from the materiality of the image, which wouldn't have served the story. Above all, they were always aware of the responsibility of taking such a personal story and translating it to animation and it has been heartening for them that Bill has confirmed their creative decisions. They wanted a layered narrative that wouldn't confuse the storyline. Once they had recorded Bill Babbitt, and edited that recording, they figured out when they needed to hear him, see him, and follow elements related to him. The rest they broke into sections to work out specific resonances and create what was happening either for Bill or for the external viewer. Sometimes they knew they wanted an interior close-up, whereas at other points they visualized him further away as he had larger perceptions. At the beginning, they wanted it to be a nostalgic, even romantic, glance at the past, before breaking into different emotional states. The issue of the animated line quality became important. They tried out different approaches. How did they want to draw his face? How did they want to show that Bill was barely holding it together? When was it appropriate to move in close to his face to simulate an intimacy usually reserved for a family member? Their main concern was not to chase and illustrate the narrative but to layer it with emotional resonances. They figured out that, in Bill's mind as he tells the story, he's always on the drive to San Quentin to visit Manny in prison. What could they take out of the visual landscape that defined Bill's sad repeated drive over the years? Having filmed and recorded Bill, I was curious why they felt the need to animate the footage? Why did they feel animation would give the original footage more force or artistry? Nomi offered a multi-layered response. Clearly, the film incorporates many more pieces of art and drawings than the usual documentary film (over 30,000 drawings). They knew how to draw, it was their strength, but they weren't as confident about how to make a documentary film. Rather than obsessing over documentary form, they proceeded with skills with which they were comfortable. One of the families they had interviewed before interviewing Bill required anonymity, which further promoted their decision to use animation. By the time they decided to lead with Bill's story, they felt comfortable enough to develop a piece to secure further funding. They chose the final sequence of their dramatic narrative. 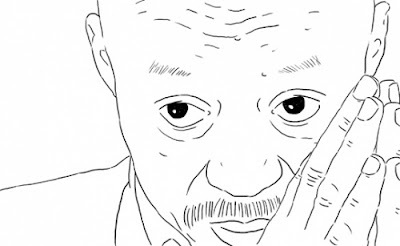 Dee had the opportunity to present this sequence to a university class, which was only partially animated and still included raw footage, and discovered that the audience simply could not bear to watch a 70-year-old man weep on screen. 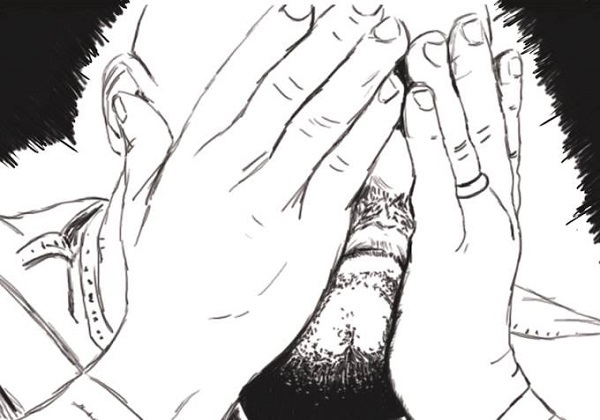 Animation provided a comforting distantiation that made his suffering palliative. "Somehow that little bit of removal allowed people to step in." Animation universalizes so you don't become overinvested in details, she explained. Of course you can identify racial features, but a little distance provides for a universalized experience and a possibility for increased intimacy and identification. Animation allows an extremely graphic and violent story such as Bill's to be shown in a manner that doesn't sensationalize it or turn it into a piece of pornographic violence. The filmmaking duo consider the families they've interviewed as being superheroes because their stories are so extraordinary. How does one tolerate or manage an experience where you're trying to save the life of a brother? Bill tried to do the best thing and then, all of a sudden, it went miserably wrong. Once they decided on how to animate his face, they sensed the potential to elicit audience identification, allowing viewers to feel they were Manny (such as when the windshield wipers segue into and signal Manny's chaotic subjectivity). When Bill specifically identifies Manny's illness as paranoid schizophrenia the animation becomes sludgy with slightly washed-out colors. Then they could depict moments that were clearly within Bill's experience. They could incorporate metaphors of stumbling and falling; moments where the past was seemingly romanticized. That's when they decided that everything having to do with Manny's veteran experience should exhibit a grainy, 16mm quality. Animation allowed the freedom to think about these experiences in complex ways that leant themselves to their strengths. They were looking at art history, looking at film, driving by billboards and thinking about images to support a really great storyline. The interstitial imagery of street scenes—particularly the image of Manny walking down the street (where it's made clear that he is mentally ill)—they created on their own while some scenes, like the war sequences, were taken from actual footage of the Battle of Khe-Sanh, in which Manny fought (among several hazardous tours of duty). Nomi indicated she wouldn't be surprised if some of the Khe-Sanh footage that they used actually included Manny. But a lot of the interstitial imagery they shot themselves, composed, then sent to be rotoscoped. They also looked at home movies. Often working with found footage, Nomi has amassed a collection of 8mm and 16mm home movies. She had already scanned several leaders from these home movies for an experimental piece she had done and—when Dee suggested they look to them as a potential resource—they discovered that, with a little color correction, they could be effectively incorporated. The first time these leaders appear is in company with the first sounds of war, which served as something of a chapter heading that finished the first chapter of Manny's deployment to the Vietnam War. The crackling radio conversation on top of the footage melds into the sound of the film running through a projector before fading away. They felt this sequence simulated old movies where you had to wait for reels to be changed that sometimes didn't happen rightaway. Manny's life was made up of all these chapters leading to the same tragic fate. Of course, they had no idea that the film would traffic as far as it has and enjoy such a winning season. My eyes will be glued to my television set come Sunday to see if the little film that could achieves every filmmaker's dream. 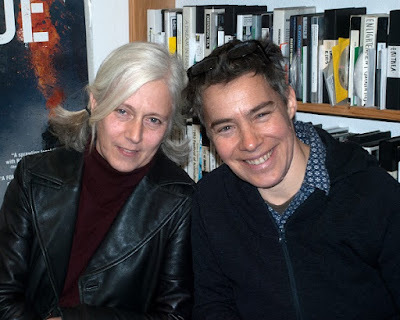 Of further interest is Pam Grady's write-up for the San Francisco Chronicle and Patricia Williams' stirring essay for The Nation.